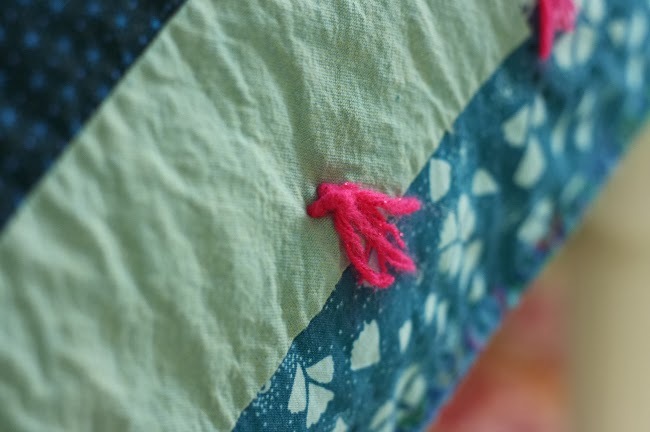 I so rarely have names for my quilts, but when I looked at this one in these photos, I thought of a rainy cloudy day, and obviously one bright spot of sunlight! So it will be called 'Rainy With a Spot of Sun"! About this quilt:I used the 'Slab Method' from Sunday Morning Quilts. The whole top is made from my scrap pile (plus a few bigger pieces). Using this Slab Method makes it so much easier to put together a random looking quilt like this. Basically, they have a diagram of how big each 'slab' should be (they're all different sizes, but fit together perfectly). To make these slabs, you sew together smaller scraps till you reach the sizes specified. Make sense? Well you should buy this book anyways! It was a great way to use up lots of scrap fabric fast! Looking at the quilt top now, I think I'd choose slightly less contrast between the two colors. The pink really stands out, which is kind of cute, but I'd prefer something more understated. I backed it with a voile again, and tied it with sparkly pink yarn. 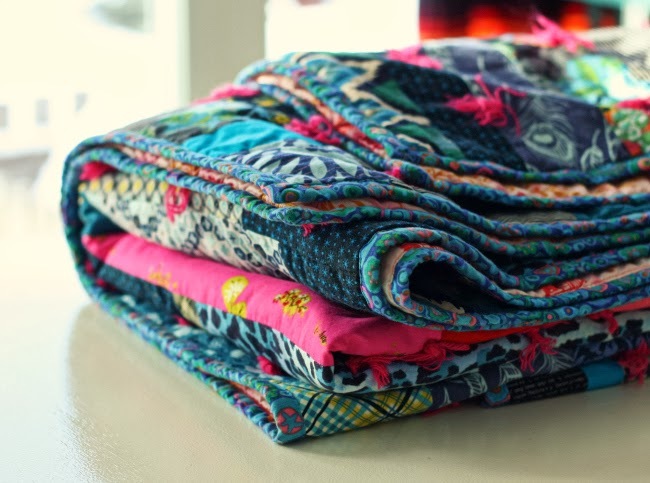 So fun, and that super squishy softness you can only get with a tied quilt! Dimensions: 51"x60", so just perfect for a lap quilt or toddler bed. This is the most perfect and lovely quilt ever. 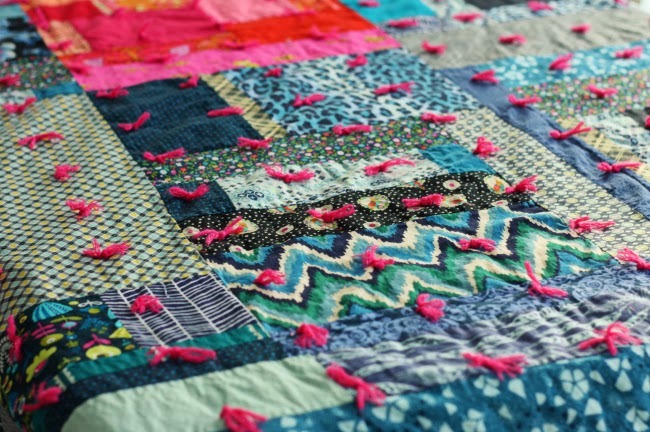 Such a pretty quilt, and I love the pink! I think I'll steal some inspiration from you, since my blue scrap bin runneth over - this is a great way to use up those scraps!! So pretty and it looks so comfy!! We must both be yearning for spring this crazy Alberta winter! I just made a baby quilt top that I named "sunshine and showers"! I must make a tied quilt sometime. I can only imagine how squishy it must be with the voile, too! Such a great, home-y aesthetic. its definitely a fun quilt. I love the binding fabric! Such a sweet Little Beauty!!! love the pink yarn! Wow! I love the spot of sunshine. I have that book. Now I better go look at that pattern and get busy. I'm inspired. Wonderful. I love a lot of colour. Sunday Morning Quilts is my favourite book btw. I love this blue and pink yarn combo! Awesome quilt!! Gorgeous quilt and great name!! I have been meaning to try the slab method. This is a perfect name, by the way. And such a comfy-looking quilt! I like! it kinda reminds me of Gramma B. 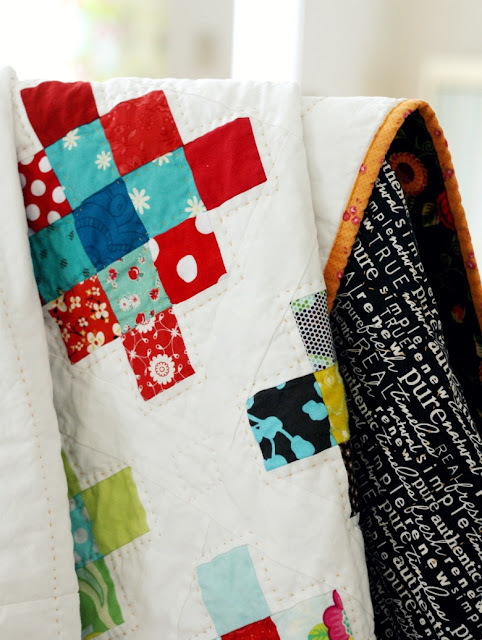 You are so right on in this post, tied quilts are the ones I like to curl up with! I like the feel of an overly quilted stiff as a board quilt - said no one ever! Lets start a movement to bring back TIED quilts! So beautiful. Those colours together are divine. It's so lovely, Jolene! Thanks for the kind plug for the book. :) your tied quilt is so cozy looking. 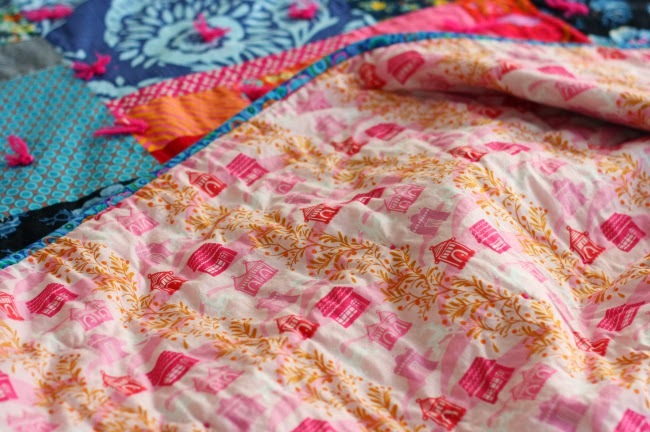 We have one tied quilt in rotation at our house and it's always a favorite. I oftentimes have to fight my husband for it! I can only imagine how lovely the voile backing would be! Well of course, I love it! I can see how the contrast is really intense, but you made it feel so right by using that particular yarn to tie and backing it with a girly voile. Tell me, do you find it physically difficult to tie with thick yarn? Like you have to work hard? if you don't, I wonder what kind of batting you use? Maybe that makes a difference. It's lovely! And looks oh so cozy. Between the tying and the voile, I would love to curl up under this beautiful quilt. Your scraps came together so nicely. I love how all the prints play off of each other. I love love love the charm of the hand ties! 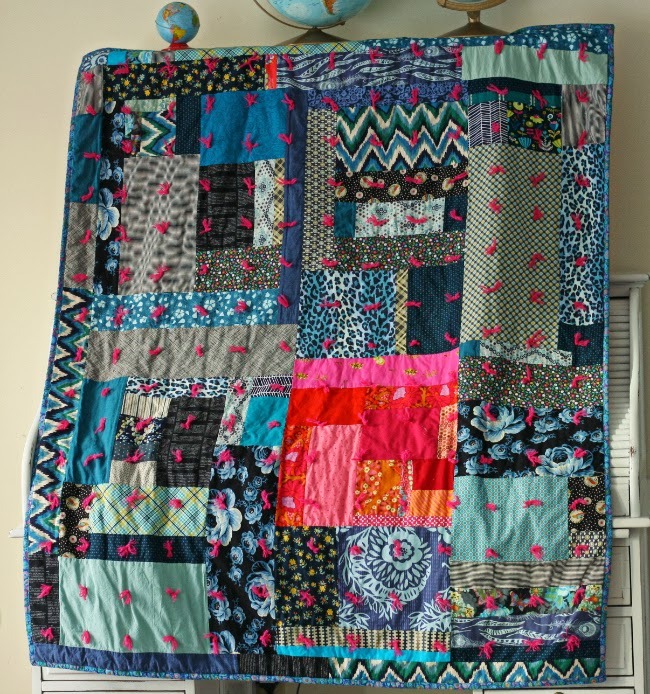 I completely love this quilt! It reminds me of the quilts my grandmother made--full of hugs and warmth. VOILE ??? Can you bring this now famous masterpiece to KQG and show me. It sounds scrumptous!. Thx sweetie.